From American Society for Microbiology. Reference area, which contains a glossary of terms, a list of tools in the lab, and an encyclopedia of selected bacteria and other pathogens. Interactive cell models, puzzles, quizzes, and more. eLS (formerly known as the Encyclopedia of Life Sciences) is a monthly-updating reference work containing over 4,800 specially commissioned, peer-reviewed and citable articles written by leaders in the field. It offers comprehensive and authoritative coverage of the life sciences for students, lecturers and researchers alike. Note other resources in left column of glossary site. Search Web for other glossaries. 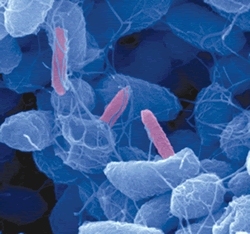 NIH Common Fund project that aims to characterize the microbial communities found at several different sites on the human body, including nasal passages, oral cavities, skin, gastrointestinal tract, and urogenital tract, and to analyze the role of these microbes in human health and disease. MicrobeWorld is an interactive multimedia educational outreach initiative from the American Society for Microbiology that promotes awareness and understanding of key microbiological issues to adult and youth audiences and showcases the significance of microbes in our lives. A wiki done by students and faculty on a range of topics relating to microbes, from phylogeny to mythology. The information is contributed by any registered user but is reviewed for accuracy. An easy-to-use site. Recommended reading in molecular biology. The latest books. Book reviews. Tables of contents. Extracts. Information and resources for molecular biologists at all levels. The Microbiology Network provides expert consultation, microbiology quality assurance training, and expert witness services to CGMP pharmaceutical, medical device, and over-the-counter companies around the globe. Founded by Scott Sutton, Ph.D. in 1996, Microbiology Network, Inc. specializes in services to the regulated industries. Fungi and the infections they cause are covered. Many photos. From a professor in Australia. בפורטל זה תמצאו מידע רלוונטי בתחום המיקרוביולוגיה ואימונולוגיה: מאגרי מידע, אתרי אינטרנט, אטלסים וכד'. רכזנו עבורכם את הספרים ואת כתבי העת החשובים בתחום תחת לשונית ספרים וכתבי עת, וכן תמונות, סרטונים והרצאות תחת מולטימדיה. מידע נחוץ למחקר תוכלו למצוא תחת לשונית כלי מחקר כמו כן, תוכלו למצוא מדריכים וטיפים לשמוש במקורות המידע השונים. The MicrobeLibrary (ML) is a peer-reviewed, digital media center for undergraduate microbiology sponsored by the American Society for Microbiology, a professional, life science society with more than 38,000 members in the United States and abroad. The scientific scope of the library covers the microbiological sciences as outlined in the ASM curriculum guidelines updated by the ASM Task Force on Curriculum Guidelines for Undergraduate Microbiology Education in 2011. The guidelines span six overarching concepts — evolution, structure and function, pathways, information flow, systems, and impact of microorganisms. All content is peer reviewed for scientific accuracy, instructional value and visual and/or audio clarity. The primary target audience is microbiology educators, although some sections may be appropriate for students. Society for General Microbiology (SGM).